Since hermit crabs are actually extremely social, octopuses typically earn the reputation as the true hermits of the ocean. These highly intelligent recluses that seem prefer a lonely life in the wild, or if they’re in an aquarium, one in which they can cleverly, constantly toy with their human captors. But new research suggests octopuses may enjoy each others’ company more than previously assumed. 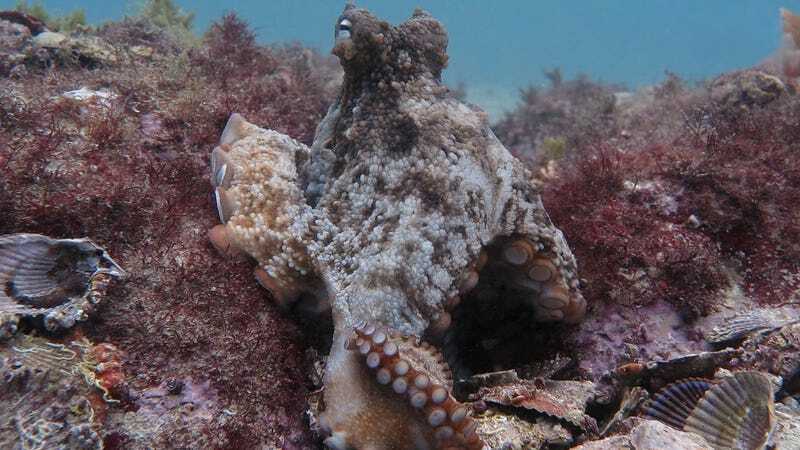 An international team of researchers has discovered a congregation of about 15 gloomy octopuses (Octopus tetricus) off the eastern coast of Australia, which they’ve dubbed “Octlantis.” This is the second discovered site of a gloomy octopus social group; the first of which—called Octopolis—is located just a few hundred meters away in Jarvis Bay. Octopolis, which was first discovered back in 2009, hosted about 16 octopuses. The team’s research has been published in Marine and Freshwater Behavior and Physiology. The researchers say that the octopuses’ weird interactions could be territorial, but they’re not sure. Honestly, octopuses are basically living in 3017 so who the hell actually knows why they’re doing this. One can only hope that octopus discourse is better than ours. If prior studies of octopuses mean anything, these humble squishes are probably plotting to take over the world. I, for one, welcome our tentacled overlords.